- Knee length chiffon and lace dress. 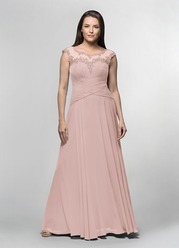 Aracely MBD is an elegant knee-length chiffon dress with a sheath skirt. 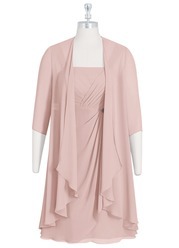 It features an embellished scoop neckline. Available in full size range (A0-A30) and custom sizing. There not enough words to describe my pleasure with this dress....I was a little apprehensive ordering it so close to the wedding but after supplying the date I realized I would have nothing to worry about it.....Well, the dress arrived a week sooner then the estimated delivery.....I could not believe when I opened the box how beautiful the dress was. The color was so rich, the fabric was so soft and comfortable and the embellishments were just enough. This dress was truly made for me, it fit like a glove, as the saying goes.....I didn't have to do anything to do, except put it on for the wedding. It was so comfortable to wear, and I received so many compliments on the dress. Thank you so much for helping to make me feel elegant on this special day....I hope everyone I told about your company will order from you and have the same wonderful experience I did with my order. Thank you again. I was so excited when my dress came in. 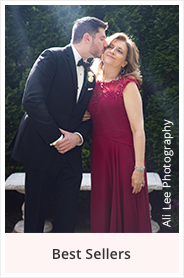 My son's wedding was getting close. I ordered a custom dress, measuring three times and, after reading other reviews, adding a 1/2 inch to the measurements. Well, you can imagine how disappointed I was when the middle was too tight. Give me a break. I had recently lost weight so between ordering the dress and loosing more weight there is no way the dress should have been tight. This seems to be a common problem with Azazie, even the tailor said she is constantly taking out dresses bought from Azazie. If you order from here, be sure to add an additional inch to inch and a half if you want to be able to wear the dress. Having said that, I do like the dress but what good is that if you can't wear it? 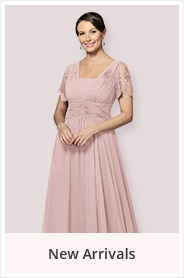 The dress is pretty, but the color is not as vibrant as shown in the picture. It doesn't look as rich, it is as the color washed off. I didn't take any stars for that because it is mentioned that the actual color may vary. 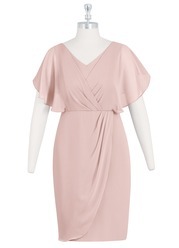 The dress arrived when Azazie said it would and I was alerted by email when it was on the way, which was helpful. It was very carefully boxed with its own garment bag and hanger, which is handy. 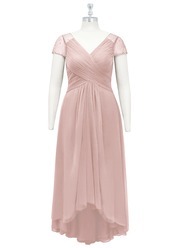 It is a very pretty dress and the color is true to the color swatch. I knew the size was not going to fit well when I ordered and had a seamstress lined up -- I am a petite size (4 ft. 11 in., 96 pounds) but the dress is not so it is requiring quite a bit of resizing by my seamstress, mainly the bodice and dress length. I had done a lot of in-store and online shopping without success. It is a dress my daughter, the bride, found online and picked out. A big advantage would have been if Azazie offered petite sizes. All in all, I am happy with my purchase. Fit was good. Color was what I expected. Material was heavier than I expected. All in all I was satisfied. Customer service is wonderful and the dress arrived weeks before the scheduled delivery date. Unfortunately the color and style of this dress did not look good on me and I returned it. 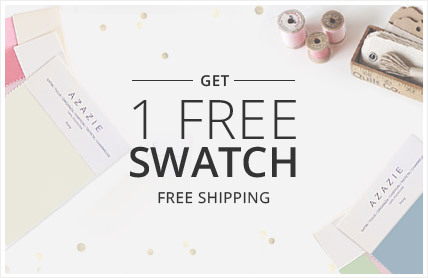 I would not hesitate to order from Azazie again. The dress fit perfect and my Mom loves it. I would also like to thank Kelly who help make sure the dress got here on time, she was very pleasant, professional, and caring.